NO FRAMES!! JUST GOOD STUFF!! 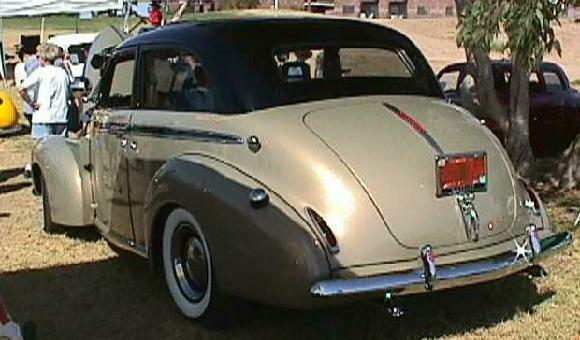 This beautiful 1941 Studebaker Champion Sedan belongs to Al and Carol Collins of Scottsdale, Arizona. Although the car appears to be stock, a warmed over Buick V-8 with dual quads is neatly nestled under the hood. Regular contributor Bill Junge of Lake Havasu sent these pictures, which he took at the 2000 "Run to the Sun" meet at his home city in Arizona. Bill now has his own web site called Bullet Nose Paradise which is dedicated to 1950 and 1951 Bulletnose Studebakers. Hopefully, Bill will keep some non-Bulletnose pictures coming my way! 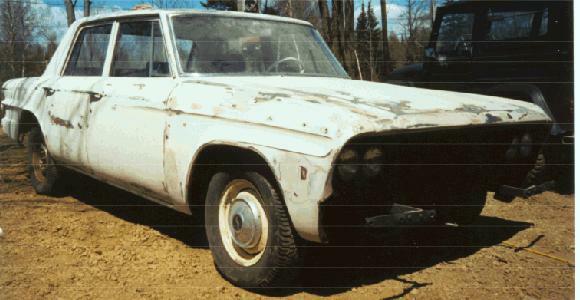 This modified 1964 Canadian Commander Sedan belongs to Carl-Andre Giroux of Quebec City, Canada. The car required extensive bodywork and a complete mechanical rebuilt when purchased, which were accomplished with great results as can be seen. Major mechanical enhancements include a 327 cubic inch Chevy V-8 and a GM TH350 automatic transmission. Custom chrome wheels and modern radial tires complete the picture. If you own or once owned a Studebaker or related vehicle and would like to see your car as "Stude of the Month" or in the "Cool Studes" section, or if you have other pictures or material that you would like to see in this page, please e-mail me here. I can accept either electronic or hard copy images. This fine looking 1956 Flight hawk belongs to Steve Salisbury of Dothan, Alabama. The Flight Hawk was the base model in 1956 with the 170 cubic inch Champion six and plain trim. It is essentially the 1956 equivalent of my 1957 Silver Hawk. The door crease left over from 1953 was not removed until the 1957 model year. 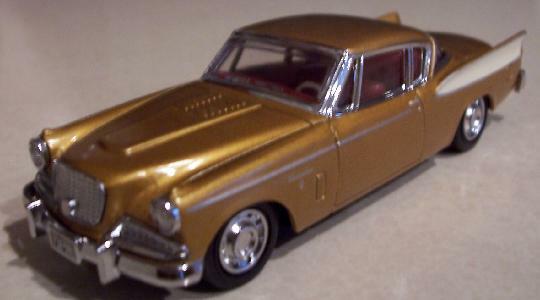 This is the second version of the Matchbox Dinky 1958 Golden Hawk. Initially issued in gold, this model was later reissued in teal as shown above. I have examples of both versions in my Stude toy collection. Although the doors and hood are fixed, this model has nice detail and is a relatively heavy casting. I believe both the gold and teal versions are discontinued, but they both appear on eBay from time to time. To see more toy Studes, visit my Studebaker Toys Home Page. Click here for information on ordering a toy Frankenstude Hot Rod, 1960's Champ Truck, 1951 Starlight Coupe Hot Rod, or Modified 1953-54 "At-A-Tude" Starliner.